Why Choose Florida Eye Doctors? We focus on taking care of your eyes, not selling our products. We specialize in second opinions & advanced treatment options. We fit hard-to-fit contacts due to astigmatism, dry eye, or GPC. We offer advanced vision correction including Ortho-K & CRT. 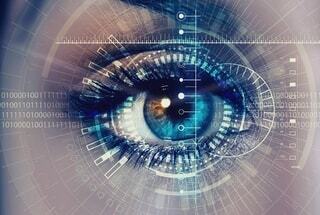 We co-manage lens implants & LASIK vision rejuvenation. We emphasize eye nutrition and its link to overall eye health. We accept a range of medical & vision insurance plans. Your Trusted Eye Doctors in Naples and Lake Worth FL. Dr. Salvatore DeCanio & Associates have been providing professional, attentive eye care to residents of South Florida since 1981. With offices in Naples , our optometrists are pleased to continue Florida Eye Doctors’ reputation as honest, caring eye doctors you can trust with your eye health. We’ll give it to you straight. We’ll let you know if you’ve been misled; if you have an eye disease such as glaucoma, cataracts, or macular degeneration or an eye condition like keratoconus; if your habits could lead to pink eye or corneal abrasions; if we think your child could benefit from Ortho-K contact lenses; and simply if we think you picked the best contacts or eyeglasses for your needs. Fast and super service from MD! Dr. DeCanio is always professional and makes you comfortable. Very honest & respectable. The one to one treatment. My Wife and I can’t say enough about Dr. DeCanio. Master of his craft !!! Highly recommend. Excellent always helpful, professional and friendly experience. Great service and sends reminders which is great in my book! EXCELLENT SERVICE, HIGHLY RECOMMENDED. THANK YOU. Great first-time visit with Dr. DeCanio. I would highly recommend him. Very thorough. Dr. DeCanio is an awesome dr. Very thorough, listens to you, very informative & never rushes you. Very friendly staff & very convenient. He’s a keeper! Always friendly and very professional! After 45 years of eye exams, I have finally found an amazing eye doc!!! Dr dicanio explained everything to me ! All questions answered !! Stop looking and go see him!!! VERY PROFESSIONAL DOCTOR AND STAFF. I truly appreciate Dr. DeCanio for being so very informative. I learned quite a bit about the current status of my eyes/vision. Welcoming, friendly office and informative, professional exam with all questions answered throughly and kindly. I had a very good experience with Dr Canio and would use him again. Experince exceeded my every expection. Very compassionate and understanding. Answers all questions clearly. Awesome eye doctar and a wonderful man! Great doctor and staff. Beautiful atmosphere. Doctor DeCcanio was highly recommended and the experience exceeded my every expectation. Great office environment and the doctor is so good and knowledgable!! I would recommend anyone to see the Doctor he takes the time to take care of you!!! Prompt, efficient and always kind! They make my annual visits quick and painless! Dr. was very professional and explained the procedures and tests that he administered. The doctor is very personable and is someone that makes your visit pleasant. He doesn’t make you feel like that your just a patient, but someone he wants to get to know. Thank you Doc! Very friendly and knowledgeable staff. Dr was awesome. Very comfortable. Dr DeCanio is excellent. Great doc and very personable. Wonderful experience. Excellent service and love the Doctor!!! Dr. DeCanio is the best!!!!! Dr. DeCanio is absolutely fantastic! He was very thorough in his explanation of the problems with my eyes (my bad for wearing my contacts waaay too long at a time!) and he explained about my astigmatism and not only that he changed my prescription as my contacts that I have been wearing which were prescribed to me by another Optometrist was not even correct nor were they contacts for astigmatism! I have never seen more clearly in my life and my eyes feel wonderful!!!! Thanx Dr. D! As soon as I walked in the front office staff were immediately available and escorted me to my appt. The doctor was thorough and look forward to seeing if the eyeglasses and prescription makes a difference in my vision. Dr. Decanio has always been a great doctor and the staff is always pleasant as well. Always a pleasure to see Connie. Dr. De Canio is the best! Great eye exam the doctor is very through. Dr. DeCanio is great. His personality and expertise in eye care is comforting. He very thorough when explaining options you might have and provides pro and cons of all; in a way that allows the patient to make the decision that is best for them. Dr.DeCanio is the greatest eye professional around. Highly knowledgeable, great bed side manor and awesome personality. Dr. DeCanio was very approachable and incredibly professional! I also had a wonderful experience with Nikki, she was very helpful. I left feeling like I was cared about. The eye doctor is great! He is very personable and genuinely seems to care about you having the best vision possible. Great visit, friendly staff, will come back and will be making appointment for my husband. The staff is the reason I continue to come. The Dr. DeCanio, Allison & Kurt are TERRIFIC!!! Everyone was super nice and attentive. Great selection of frames. Promptly seen and office very efficiently run. Dr. DeCanio was kind and very professional. Glad we are now patients! Great service. Doctor explained my overall eye health, future risks, and provided me with the perfect lenses. Overall atmosphere was calm, unrushed and very welcoming. I plan to recommend this doctor and location to all my friends and family. Thank you for great service. Wonderful, informative, friendly doctor and staff! Please note! I’ve never been treated better by any place in the world! Between, Jan & Allison, along with the Dr., it has been a wonderful experience! Thank-YOU so much! I had such a great experience! It was my first time putting on contact lenses and they were so patient with me. I didn’t feel rushed and we shared lots of laughs along the way! Dr DiCannio is kind, patient and works with great dedication to solve the patient’s vision issues – he is an outstanding professional! Very efficient and professional. He diagnosed and recommend a solution for a problem I have been having for a couple of years and no other doctor diagnosed. Awesome doctor. Happy to have chosen him for my first ever eye appointment. Thanks. quick service and very informative, personable. I have been to a couple of eye doctors, this is definitely the first time that I felt valued. Dr Salvatore took the time to answer all of my questions, was very patient with me and explained with detail every step of the procedure, he added a personal touch that many people forget to have with the consumers. I recommend strongly to visit this awesome place everyone in that office is just great. I was very impressed with Dr. DeCanio, he listened to my concerns and asked me questions that no other eye doctor in the last 30 years has ever asked me before. He solved my vision problems and correctly fit me with just the right prescription and I no longer have issues with eye strain. He patiently answered my many questions and he truly wants his patients to have the best care and service. The doctor was very helpful. Also kind. I would like to see him again. He was great!!! very help full and great with kids. I had 2 appointment for my son and I and I was there for only a hour without feeling like I was rushed to get the next person in. Very professional, explained in detail what was being done & what needed to be done. Office staff was great also. It has been years since I last went to an eye doctor’s office, but if I had experienced what I experienced today with Dr. DeCanio I wouldn’t have waited all these years. He was and is fantastic. I will be sending my wife and two daughters to see him shortly. I liked the Doctor and the staff. Enjoyed the experience. My visit with DR. Salvatore De Canio was very satisfactory. His staffs were so kind and hospitable. DR. Salvatore himself was very kind and so professional with understanding. I will really highly recommend him to every body. Great experience? Review us online! Our eye doctor specializes in hard to fit contact lenses. In addition we stock the latest contact lenses at great prices. We have a full selection of daily disposable contact lenses, weekly, monthly and more. Advances in contact lens technology means even if you experienced discomfort in the past with contact use, such as dry or tired eyes, there are contact lenses right for you! 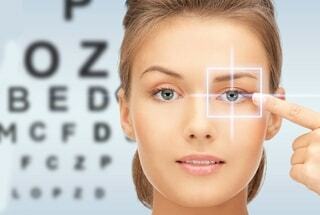 There are many optometrists in Naples that offer eye care. What sets us apart from the others is our commitment to investing in the latest technology to offer our patients the very best eye care. An example is our optomap® Retinal Exam which takes ultra high definition images of the retina, allowing our eye doctor to see things others cannot, all without dilating your eyes! A comprehensive eye exam by our highly trained and experienced eye doctor is not about rushing you through the process to see the next patient. Our eye doctor treats every patient as if they were family, providing the absolute highest level of eyecare and providing each patient with attention and care. Whether you are looking for an eye exam for your child or eye care for medical issues like glaucoma, dry eyes and macular degeneration, our optometrist is here for you. Second Opinion - When is it a good time? I’m just not happy with how I am seeing with my new eyeglass and/or contact lens prescription? The previous eye doctor didn’t address my concerns and/or did not explain important things to me. I felt I was rushed and was not able to have my questions answered. My vision is still blurry and I don’t know what’s really going on with my eyes and vision. The treatment plan I was given is just not working, even despite multiple visits. We believe in informing our valued patients openly and explaining things in terms you can well understand. Straightforward answers to your important questions, professionally. Make a more informed decision about your care by verifying your diagnosis and learning about advanced treatments not offered at all eye doctors. 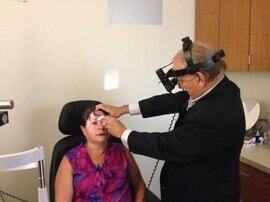 You are in good hands at Florida Eye Doctors, the trusted practice for a second opinion in Naples, Florida. Eye Emergencies-When Should You Visit Your Optometrist? Are your eyes suddenly red and painful? Do you have Pink Eye? Experiencing new onset flashes and/or floaters? Have a foreign body in the eye (especially metal or chemicals)? IMAGINE your child not having to wear their glasses throughout the day! 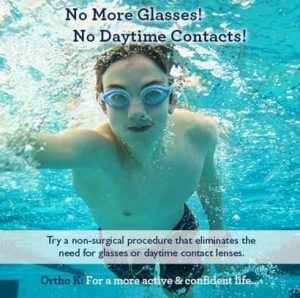 Ortho -K, short for ortho-keratology, is a very safe and successful, FDA approved method to slow or even stop myopia progression in your child. Well researched and clinically studied, this non-surgical, painless procedure involves reshaping the cornea (the front window surface of the eye) to change its prescription power by wearing a contact lens every night at bedtime and is removed every morning upon awakening. When your child wakes up everyday they have 20/20 vision without the need for eyeglasses! Athletes, to avoid risk of injury from contact sports. Teens who don’t like the look of Glasses. Teens that tend to break and lose things often. Teens who are not able to wear standard contact lenses. Teens with Dry eyes or discomfort from contact lenses. Individuals that are too young to be eligible for Lasik surgery. 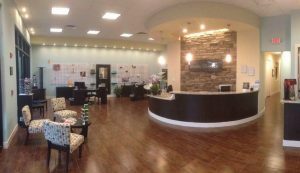 We offer the residents of Naples Florida the highest standard of Ortho-K treatment. Our Optometrist is a founding member of the Optometric Council on Refractive Technology and has over 15 years of dedicated experience in Advanced Vision Correction. Set up an appointment with our eye doctors to schedule a straightforward evaluation to see if your child is a good candidate. Q: What can I do to prevent dry eyes? Our Optometric (Eye) Physician, Dr. Salvatore DeCanio, is proud to be serving the communities of Naples and Lake Worth Florida. Our eye doctor has a wealth of industry leading experience, including Cataracts, Corneal Shaping without eye surgery(Ortho-K) and LASIK with over 32,000 “eyes” treated successfully. He is on the executive board of the prestigious Optometric Council on Cornea, Cataract & Refractive Surgery, a former adjunct professor at Nova Southeastern College of Optometry, and formerly the 18 year co-chairman of the nationally acclaimed Palm Beach Winter Seminar. Aside from his pursuit of professional excellence, Dr. DeCanio is well known for his straightforward yet caring manner and loves treating a wide variety of patients from children to the elderly. Dr. DeCanio is proud to offer his professional services with attentive eyecare excellence at two beautiful locations in South Florida at both his Lake Worth and Naples independent locations. Dr. DeCanio chose this very unique direction because he loves to focus on the vision care and medical eye treatment aspects of optometry independent of the recommended materials involved. At both the Lake Worth and Naples eye doctors offices, you will find the latest in eye care technology, a knowledgeable and friendly doctor and staff, and a modern and equipped practice. We respect your time and are known for our prompt, courteous service. Many of our patients came to us for the first time for a knowledgeable second opinion. Use your CareCredit account to get all your services and eyewear interest free for 6 months. It only takes 5 minutes to complete the application process and we can help you! Click to start your application right now! Please call in advance for doctor hours or to schedule an appointment.